Orphen is a nice representation of the kind of anime that we used to see on a regular basis; nothing earth-shattering but generally well-made, entertaining and fun to watch. Fans of both serious and comedic fantasy anime will likely find a happy middle-ground with this series. While Slayers is mostly off the wall and goofy, Orphen is more down-to-earth. While Berserk is dark, gritty and violent, Orphen never takes itself too seriously. For those tired of complicated anime plots which may or may not answer everything in the end, Orphen should be a welcomed change. Orphen is pretty straightforward in its storytelling, but throws in a few twists at the right times in order to keep the viewer’s interest. The show, thankfully, does a pretty good job of wrapping things up by the end, while leaving things open for more adventures. the show’s halfway point, the main plot comes to the forefront and stays there. The filler episodes aren’t bad, like I said, but those with less patience than I may get annoyed at the somewhat slow pace of the main plot. To be honest, I prefer this format for anime. The fillers are good and well made and relate to the story well enough for me to believe they belong there. I can understand why a few people might not like this idea but I am a fan of longer anime in general and the short ten-to-twelve episode anime we have been seeing as of late, feel a little too short for me. I imagine the reason the filler episodes didn’t bother me so much is because of the likeable characters. The characters are a big part of what made this series appealing to me,which I’ll touch on in a second. Naturally one of the most interesting and likeable character is Orphen. He’s neither a magician guru, nor an annoying novice. He’s determined to reach his goals and, while he often gets frustrated, he never gives up. On the other hand, he’s a little too head-strong. He gets an idea in his head and is too stubborn to look at the other side of the coin. I didn’t find Orphen’s company, Majic and Cleo, as interesting, though. It’s not that they’re bad characters or anything, just a little basic. Majic’s timid, but logical, and has a lot of desire to be like Orphen. What’s amusing is he has lots of potential but sometimes when he displays his potential, Orphen yells at him and afterwards thinks, “It takes most people five years to do that kind of magic. At this rate, he won’t need me in a couple years!” (Majic’s father is footing the bill for their journey, after all.) He has heart, but all in all his character boils down to an underdog apprentice. I didn’t find Cleo all that likeable at first either. For the first twelve or so episodes she accuses people of being Peeping Toms, or perverts, and promptly tries to teach them a lesson. In the latter half of the series she thankfully becomes nicer, but doesn’t evolve much beyond a standard supporting female anime character and this really irritated me. Throughout the anime there are many episodes when having a strong, capable female lead would have greatly enhanced the moment or provided for a deeper, richer story. Moreover; as a regular character, Cleo would have been perfect for those scenarios but she was never really fleshed out beyond a bratty, slightly annoying, headstrong damsel in distress – even in the later part of the series. Then we have a couple oddballs in the form of Dortin and Volcan, two child-looking, midget characters. Dortin’s pompous stubbornness and refusal to take any responsibility for his predicaments is amusing on its own, but gets downright funny at times because his poor sister Volcan has to endure his rants, and abuse, plus the abuse from Orphen whenever he casts a spell to blast them far away. They’re definitely a good comedy relief duo. The series is also kind of interesting to look at. The art and design is soft and earthy, which matches the world’s rural setting quite well. The backgrounds look like they were lifted from various sketches one might see when looking for additional background information on a big fantasy series like Lord of the Rings or Harry Potter, only with more detail and color. They may still be too low-detail for some, but they made a small impression on me when I saw a random fansubbed episode many years ago. We don’t see enough anime that values art skills these days. It seems that in this high-tech world, we have forgotten what it’s like to watch an anime that is not full of photo-realistic characters and backdrops that could easily been New York City – taken from a camera drone that morning. The character designs are fine; they don’t shine but they don’t stink, and the animation is above average for a TV series of its time. All of the above comments remain consistent for about 75% of the series. There are about three episodes which have a noticeable drop in animation and art quality and there are two episodes which do just the opposite. 22 of the 24 episodes are done traditionally (on cels) while two episodes are digitally animated. Perhaps the budget was wearing a little thin during production and since digital animation is cheaper to produce, the creators choose that route instead of having more episodes look cheaper than the rest of the animation. I’m fine with that since, on their own, those two episodes look pretty nice. The only drawback is my eyes had to adjust both times. The digital episodes look especially bright compared to the others. Rounding out Orphen’s generally solid production is the audio. For the vocal part of it, the Japanese version is quite good. As Orphen, Shoutarou Morikubo is very good. He’s funny when Orphen’s lighter side shows through and effective for his angsty and dramatic moments. Orphen is a pretty sarcastic guy, and Morikubo’s voice is just dripping with it. I wasn’t overly fond of Majic’s voice. He sounded too young and feminine for my tastes, but he’s acted well enough. Cleo sounds exactly as one would expect her too. She hits the right marks, but doesn’t have that extra bit of “oomph” to make the performance really memorable. However, the Tower of Fangs Elders are appropriately commanding and evil-sounding, and the actors behind the important characters from the Tower of Fangs perform well. Extra, minor and episodic characters are good enough, making for a reasonably balanced listening experience. Unfortunately, the Japanese version is hampered a bit by ADV’s subtitle translation. The name of the translator for this show is Beni Hiriyama. I don’t want to sound rude, but when I see his name in the credits, or hear prior to a show’s release he’s doing the subtitles, I just can’t get all that excited. His translations are too literal and stilted. There are a lot of lines in Orphen which he could’ve made clearer and some which don’t make any sense no matter how you look at them. I wish ADV would pair him with another translator, or have the subtitle editor work with him closer, or something. I know translating Japanese isn’t an exact art and subtitles almost never sound 100% natural when read aloud, but his translation for Orphen is a bit of a chore to read. I could basically understand the point the subtitles were trying got get across, but I’ve been watching subtitled anime for a long time. I could see someone who isn’t as familiar with the format having a difficult time. Then there’s the dub. Oh dear, oh dear, oh dear… I’ll start with the positive, which is the acting. It’s good stuff for the most part. Orphen is definitely sarcastic and funny enough, and believable during the show’s serious moments. Cleo performance was too modern-sounding and airheaded for my tastes. The same can be said for the Japanese version, but I found the dub took it way too far at times. I preferred Spike Spencer’s take on Majic (mostly because he doesn’t give the character a girly voice) and the rest of the cast, populated my many familiar ADV talents, sound good. But the script, by infamous ADV ADR director and scriptwriter Steven Foster, leaves much to be desired. His work on Orphen is what made many anime fans sit up and take notice of his alterations for a few reasons. He had done several dubs for ADV before Orphen and they had similar alternations, but when Orphen first came out people found his changes to be extreme and especially noticeable (not to mention it was one of his first dubs to be released on DVD, so the original translation was readily available). Orphen’s dub dialogue is too modern, first off. It’s peppered with re-writes such as Dortin yelling “Go Dragon! Go Dragon! It’s your birthday!” in the first or second episode, while he says something along the lines of “Go monster! Kill him, kill him!” in the original. The re-writes also affect the story and characters. In the sixth episode, Cleo does adopt a “Deep Dragon” named Leki in the subtitles but a “Wolfen” of the same name in the dub. In the original, Orphen has commands for his spells, while in English, Foster just made up things for him to say. To be fair, what I said above applies more to the first six episodes than the latter 18. From the third DVD on it seems that Foster had at least partially listened to the outcry from fans (and what an outcry it was, believe me) and the dub script sticks quite a bit closer to the original. It’s still pretty loose on its own, a little too much for my tastes, but it was a small victory for the fans. Unfortunately it seemed that Foster didn’t learn his lesson well enough though as the dubs he did after Orphen were still altered way too much. Once again, I don’t want to sound rude. Like I said, the acting in this show is good and the same can be said for any of Foster’s dubs in general. The man has talent as a director and if he had of been kept on a tighter leash while writing scripts, or if someone else had written an accurate script while leaving the directing to him, I’d be happy. By the time the dub scripts for Orphen were written though, Foster had already been in the business of script writing for a significant period of time so we can’t complain too much. As with any script written by Foster – we know what to expect and he always delivers. He believes a dub should be judged on its own merits and not compared to the original. When it comes to casting and acting, I’d tend to think that’s a fair statement, but I don’t just like anime for the pretty pictures, I like it for the unique storytelling. That storytelling is either severely altered or completely lost in Foster’s scripts. With the anime situation being what it is in Western hemisphere of world, the people who help bring it to the English speaking public should no longer feel the need to alter it the way it was in the ’70s and ’80s. It’s a real shame. Anyway, I digress. The point is I cannot in good conscience recommend the dub for Orphen. I have of course watched the dubbed version and did enjoy it but there are some anime which simply demand to be watched in their original form (perhaps assisted by well written subtitles for those who can’t understand Japanese) and Orphen is one of them. As for the music, it’s a mixed bag. There are lots of bits with loud electric guitars and whatnot which sound good enough on their own, but clash with the fantasy setting. The best example are the riffs played during the eye catches. When I showed a few episodes of this series to a friend, she kept remarking how that bit sounded like it was lifted from Mortal Kombat and I agreed. Loud electric instruments do not belong is a historical fantasy. This is a lesson that every anime studio needs to learn in my opinion. 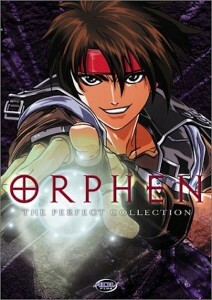 If you take the music out of Orphen and play it as music – it is a well written, well played rock-esque fantasy fest but when you are trying to watch a guy fix a broken wheel on a horse-drawn cart – loud electric guitars only serve to jerk you out of the moment and break the emersion of the anime. However, there are some rather nice musical pieces which fit well with the setting and are a pleasure to listen to. There are two different opening and ending sequences to this show. They all sounded okay to me but I liked the second OP and first ED the best. I am sort of happy with how this has turned out, although it doesn’t seem to be perfect – at least it is installed on my own domain and it is working. Next Next post: Virgin Media – Mobile Phones: Are they really a good deal?